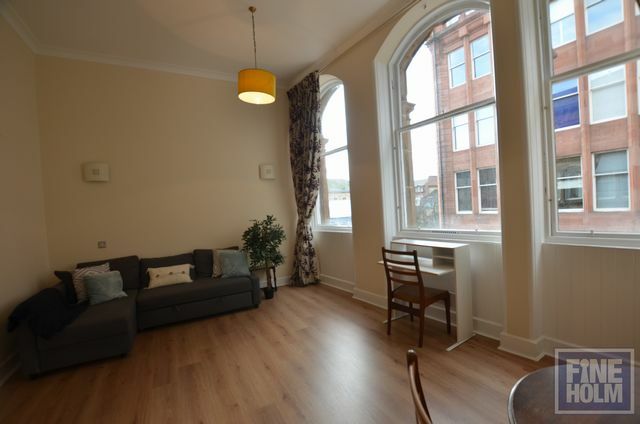 Perfectly located Merchant CIty flat, in the popular Albion buildings with restaurants, bars, cafes and fantastic shopping right on your doorstep! This converted flat is on the 2nd floor of a well maintainned building with lift access - the entrance hallway leads into double heighted living space with great living and dining space, this leads into a modern kitchen with appliances provided. The bedroom is to the rear with fitted wardrobe space and huge windows. Bathroom in the center with shower over bath. Electric heating. Secure access.Original sash windows. The building also offer a large turfed area to the rear for communal use. Ideal for someone keen to appreciate Glasgow bustling city center!